REQUIRES 2" BALL AND 4-PRONG FLAT PLUG. ACTUAL WOOD DECK SIZE : 8' 1" W/ 2.5" OF RUB RAIL OVER-HANG EACH SIDE X 20' LONG W/ 2' V-NOSE FRONT - BED HEIGHT 28"
NO IN-BED TIE DOWNS - CARGO MUST BE STRAPPED TO RUB RAIL. 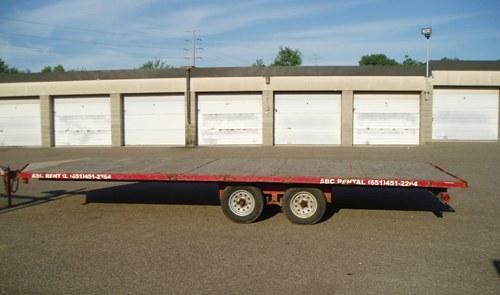 * Please call us with any questions about our trailer 8 foot 1 inch x 20 foot flatbed rentals in South St. Paul MN metro area.